All are four coats over one coat of China Glaze White on White, topped with Seche Vite. I haven't worked with neons much, but I had good luck with a few and not so good luck with others. One thing to note: These dry super fast, which is really nice, especially when you are having to do 4 coats! I got good coverage and nice color from the blue, pink, and green, but wasn't happy with the result with the orange and yellow. The latter were quite streaky and I wasn't even sure that a 5th coat would take care of it, so I didn't try. I think these will make great pedi colors and can see myself sporting the the blue, pink, and green (and also Flip Flop Fantasy, which I have actually already done a pedi with) all summer. Disclosure: This polish collection was provided to Sasha by China Glaze for review purposes. SO love this collection, it makes me itchin' for summer weather! i looove this collection !! I love this collection! If I recall, I think you posted this swatch once before. Or maybe it was Smoochiefrog. I remember because I commented the colors really did make me think of Skittles. Sorry to hear that the yellow and orange were streaky. Can't tell in the picture. I HATE orange with a passion so I wouldn't wear that one but I'd wear the rest of these colors. I heart the pink and blue ones the most. I don't have these colors, so it wasn't me. 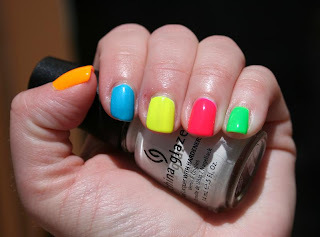 :) I did do a Skittles mani around Valentine's Day with the Up & Away Collection. Maybe that's what sprinkles is thinking of. I can't do bright colors like these, but they look great on you Sasha! Fantastic! I will really have to get the whole collection now. I can't help myself when it comes to the neons, even with their streaky ways. Thanks for inspiring me to do a skittle mani with them. My preschoolers (that I teach) will freak when they see it - they love when I wear wild colors. I'm sure Smoochiefrog is probably correct, I'm likely thinking of the post doen around Valentine's Day. In fact, I can visualize it now in my mind.